E45 Junior Foaming Bath Milk is a fun, foaming mousse to gently cleanse and moisturise your child's skin. E45 Foot and Heel Cream helps moisturise the skin around the foot area and gets rid of rough skin. E45 Lipcare gives you on the spot relief from sore and chapped lips. E45 Moisturising Lotion is an everyday moisturiser for the whole family. 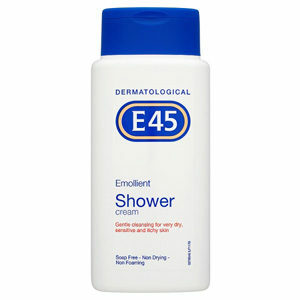 E45 Shower Cream gently and effectively cleanses your dry skin, leaving it feeling soft and smooth.